Former Naval officer and graduate of the U.S. Naval Academy David Voigts is voyaging across America from Delaware to California along the American Discovery Trail to raise awareness for a growing group of victims including men, women, and children being assaulted with electronic weapons. He started his journey in May and plans to take several months to complete the journey, educating the community while carrying a portable backlit billboard capable of scrolling text. Voigts has a degree in Control Systems Engineering and served in Electronic Warfare and Nuclear Billets. While in service he became aware of ongoing illegal non-consensual human experimentation projects studying human-machine interface. These illegal and unethical projects use non-consenting victims referred to as “Targeted Individuals” to conduct various psychological and physical experiments with the use of electronic warfare weapons that essentially torture the victim psychologically and physically. This important social issue affects hundreds of thousands of individuals in America. 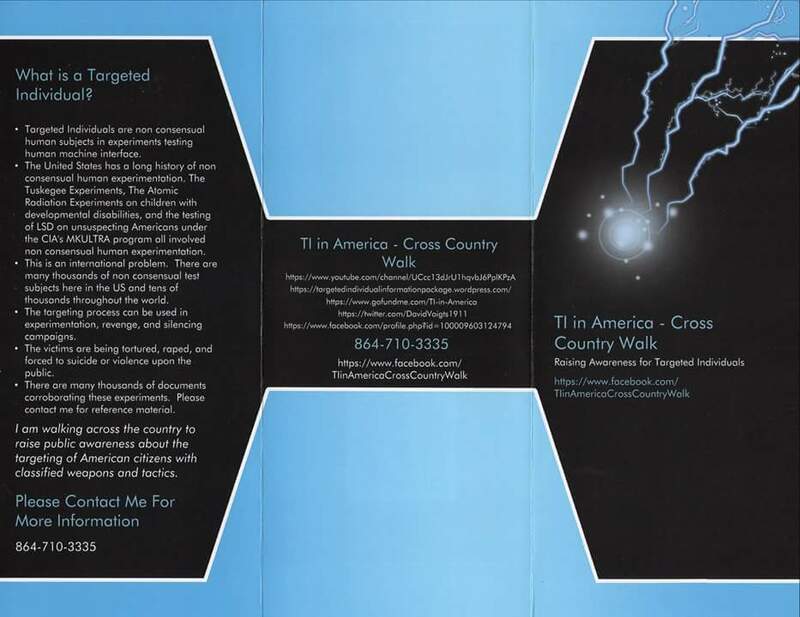 As these weapons are often used covertly, many victims of this electronic harassment including men, women, and children, may not know they are targeted and are not able to recognize many of the symptoms. Raising social awareness and increasing support on this critical civil rights issue is essential to ending these crimes against humanity. During his service Voigts heard a holocaust survivor present her story then appealed to the group that if they ever saw anything like that happen again to take action against it. This left an impression on Voigts as he discovered the horrific details of this human experimentation program with electronic weapons. A true American hero, Voigts stated, “I intentionally got myself drafted into the program to help me understand it better so I could help shut it down.” To learn more and support Voigts in his efforts, see below contact information. The brochures were delivered today. Plan on going door to door with the backpack billboard over the weekend and next week. I got them from Vistaprint. They are running a 40% off promo using the code FRIENDS40. I think they could be used on the same brochure. Might be able to get a few for a reasonable price. Here’s the link. I’ll post some pictures when I get back to Dwight. Let me know if that link works. My name is David Voigts. I am writing to introduce an important social topic. I grew up in Dwight and consider it my hometown. I have many friends and family that still live in the area. I’ve been corresponding and sharing information with friends and relatives since last fall. They have had a few months to review the relevant material and may help to introduce this topic. After graduating DTHS, I joined the military. While in the military, I became aware of some illegal activity. Specifically, the United States –and a few other industrialized nations- are engaged in non-consensual human experimentation. This program relates to my career field. The experiments are testing human-machine interface. This issue has reached the public awareness a few times. However, the appropriate actions were not taken. In order to explain the situation, I will detail my training and expertise and how it relates to this issue. Also, I will discuss a bit of the history of non-consensual human experimentation. I will explain how I found out about this program, and what my ethical responsibilities are in bringing the crime to the public’s attention. Finally, I’ll detail what can be done to help the victims. I am a graduate of the United States Naval Academy. I earned a degree in Control Systems Engineering. The discipline draws upon electrical and mechanical engineering and computer science. A Control Systems Engineer uses design parameters to develop an overall schematic of how a system will work. I was trained in electrical and mechanical design process from base mathematical equations, to computer modeling, and how those models are used to select the physical components of a system. Part of the training discussed human-machine interface. We studied new prosthetics, and systems that allow “locked in” patients the ability to communicate through computers using brain-machine interface. There were hints about weapons testing. As an officer, I served in Electronics Warfare and Nuclear billets. I found out that the program is testing weapons called “Voice of God” or “Hand of God” weapons. When used in conjunction with a psychological warfare campaign, they are called “Perception Warfare,” “Spiritual Warfare,” or “No-Touch Torture” weapons. I have enclosed a list of suggested reading on the back of a business card. The books will explain the program in great detail. In addition to academic classes, the Academy requires a full military education. I took classes in Naval Law, Strategy & Tactics, Leadership, Weapons, and Ethics & Moral Philosophy. Also, there is an extensive character development program. There were speeches given by POW’s and Holocaust survivors. We studied the Law of Armed Conflict, Law of the Sea, and Uniform Code of Military Justice. There were many case studies and scenario based philosophical discussions. In our humanities courses we studied the Soviet Gulag system. We read books by Solzhenitsyn and The Lottery by Shirley Jackson. We reviewed Milgram’s Experiment on Authority. We discussed social dynamics and how the ordinary men in German reserve police battalions were led to facilitate the Holocaust. Throughout the training, we were taught to pursue ethical choices despite inappropriate groupthink. However, an ethical bias is not the case in all parts of our government. There’s a long history of non-consensual human experimentation in our country. The Tuskegee Experiment, the Atomic Radiation Experiments on children with developmental disabilities, and the testing of LSD on unwitting subjects under the CIA’s MKULTRA program all involved non-consensual human experimentation. Additionally, during the fifties, sixties, and seventies the FBI ran a program called COINTELPRO. The program involved surveillance, infiltration, disrupting, and discrediting, a number of organizations. Under the Church Committee, the COINTELPRO program was deemed to have exceeded legal authority and violated Constitutional limits. Many other government agencies run similar programs. Furthermore, a 1977 Joint Hearing before the Senate Select Committee on Intelligence and Subcommittee on Health and Scientific Research revealed the abuses under the MKULTRA program. The crimes are almost indescribable. The CIA Director tried to conceal the program and ordered all documents destroyed in 1973. A Freedom of Information Act request resulted in the recovery of financial documents. The 1977 Joint Committee did not uncover all of the details. Because no effective action was taken against these programs, they continued under new agencies and budgets. There are victims who are still in the legacy Cold War programs. The current program is horrendous. Simply put, this is a domestic torture program. Victims are harassed by intimidation groups and physically and sexually tortured 24/7 through technology. The frightening thing is that people around the victims often know what is going on. Some are even co-opted to participate in these crimes. Obviously, this program must be brought to light. The first step is to raise awareness. Widespread knowledge of the program will bring forth witnesses on both sides of the issue. With lots of credible testimony, legal opinions could be sought. Favorable legal opinions could encourage those with access to discuss the program. With their help the criminal activity could be disclosed publically. When I found out about this crime I positioned myself so that I would be placed in the program. I wanted to investigate the process and learn the details of how the crime works. In addition to classroom study, I had read a few military non-fiction novels (non-fiction Tom Clancy style books) while trying to decide which military career path to pursue. The books on submarines discussed tapping undersea cables and alluded to modern surveillance capability. With the Snowden revelations, I’m sure most understand that everything on the internet can be traced. I knew in the early 2000’s that everything I wrote on the internet could be mapped out. There are algorithms that can tag an email address or social media account and correlate the internet handles, writing structure, and password use across all internet traffic. Also, I read books on special warfare. They discussed some of the COINTELPRO style tactics. The books detailed how military vets with certain skill sets (interrogation, surveillance, and psychological warfare) are sometimes hired on in harassment and revenge campaigns. I used that knowledge and crafted a fairly complex plan to gain entry into the program. I used the comments section of television shows, news articles, and product reviews to demonstrate knowledge of the process. I left comments on projects of people who I guessed would have access to this illegal targeting program. I explained my concern and recommend that I be put in the program to evaluate the capability and legality. The plan was accepted. I’m in the program and I’ve figured out much of how it works. One of the victims’ groups are calling themselves “Targeted Individuals.” They are victims of organized intimidation stalking using COINTELPRO style tactics and electronic harassment using “Perception Warfare/Spiritual Warfare/No-Touch Torture” weapons. There are at least several thousand in the US alone. There are many tens of thousands around the world. The numbers could be much larger. To be quite honest, this program may be like the dragnet surveillance programs – it could affect everyone. Two real-life examples demonstrate how this program has affected our lives. The Navy Yard Shooter and Florida State Shooter both left evidence proving they were in this program. The Navy Yard Shooter wrote on his gun –quite obvious- which was reported in the news. Also, he left phone messages, and emails with human rights groups. The Florida State Shooter left three 40 minute YouTube videos, phone messages, and emails with human rights groups. There are many more similar cases. I do not condone the violence, but I do understand what they were thinking. This is a 24/7 wireless torture program. They reached out, but were unable to find knowledgeable people who were able to disclose the criminal activity. They acted in desperation to draw attention to their torture. It’s essential that the targeting program be exposed. We cannot allow torture of our citizens. Everyone has inalienable human rights inherent at birth and guaranteed by our Constitution. The YouTube videos can be viewed by YouTube searching “My Experience as A Targeted Individual.” I corroborate the information Myron May discusses in those videos. It’s a real program. These weapons are only authorized to be used on enemy combatants and key support personnel in a declared war abroad. You can’t use them on civilians in your own country in revenge and silencing campaigns. That’s illegal and unconstitutional. As mentioned above I have included a business card with some suggested reading. The shortest book is about 90 pages. It’s titled How to Tame a Demon by Dr. Robert Duncan. That book will give a quick overview and can be read in an afternoon or two. Guinea Pigs by Dr. John Hall is another quick read that covers the topic well. To help expose the program, here in the next week or so I will be starting a walk across America. This illegal experimentation/targeting program can be difficult to discuss, but it must be addressed. Some react to the information with fear or freeze up, feeling that nothing could be done to address this issue. So, I am attempting to create a human interest story to help convey the information and alleviate hesitance in discussing the topic. Much like the details of the Holocaust, this topic should be common knowledge. With awareness, a coordination to end these crimes will be created. I encourage all to share the social media posts about the walk, and to discuss this topic with friends, family, coworkers, church/social groups etc. The victim’s will be forever grateful for your assistance in relaying the information. I will be following the American Discovery Trail. The American Discovery Trail (ADT) Starts in Cape Henlopen Delaware and goes westward to California. You can read more about the trail at http://www.discoverytrail.org. If the trip is productive I will continue back east on Old Route 66. I have purchased GPS maps for both the ADT and Old Route 66. I will link the intended route on Facebook and Twitter each morning at 10 a.m. eastern time. As a marketing gimmick, I will be wearing what’s called a “backpack billboard.” The billboard is backlit like the directory at the entrance of a shopping mall or the lighted movie posters outside a theater. I have a few videos of the billboard on my Facebook page. The unit can be viewed at backpackbillboards.com. The billboard signs have 3 QR codes. They link to websites discussing the trip. That way, passersby will be able to get information about the trip directly from the sign. I will be pushing my gear in a dog bike trailer. Everything fits well enough, but I will need to cache water ahead of the travel route in a few stretches in Colorado, Utah, and Nevada. Also, I’m handing out business cards as I go along. In addition to the suggested reading, the cards display 4 QR codes that link to the Facebook, Twitter, GoFundMe, and WordPress pages I’ve set up for public outreach and to document the journey. These QR codes can be read by smartphones. If one is not familiar with their use, they are like a barcode. The newest smartphones will capture the QR code just by focusing the camera on the square block (without snapping a picture). If the smartphone doesn’t have that native capability, then QR code reader apps are available in the Apple, Google, and Amazon app stores. Feel free to test out the QR codes on the enclosed business card. One could even take a picture of the card and post it on Facebook. 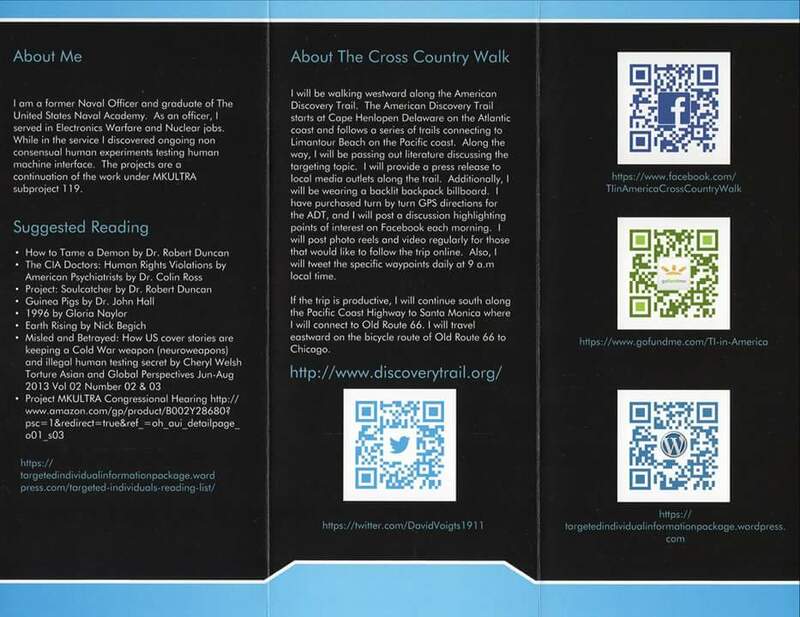 Anyone on a friends list would be able to read the QR code and link to the websites discussing the walk. The intention of the trip is to raise the initial awareness about the targeting issue. The suggested reading will explain all the details of the program, and should make the topic “real” to people. Along the way, I plan to stop at each local newspaper and drop off a Letter to the Editor. Also, Facebook has advertising capability based on location. I plan to buy an ad as I walk into each zip code. A $5 or $10 ad can reach several thousand users. So with the backpack billboard, business cards, Letter to the Editor, and Facebook/Twitter ads, I expect the topic will get some decent exposure. Also, sometimes the regional TV affiliate will come out to interview ADT thru hikers. That might be another avenue to raise awareness. In summary, the information on the topic is available. There are professionals who can help explain the details of the technology and how the organized intimidation campaigns work. The victims are available to explain their experiences as well. We just need the public to take some actions. Sharing the topic on social media goes a long way. Reading the books will make the topic “real.” Once the trip is over, I will do some public speaking, advertising, and writing on the topic. Keep that in mind and mention the effort to your clubs, social, church groups etc. Also, call me. I can be reached at 864-710-3335. I’ve heard most of the questions and can point toward good primary source information that will answer questions about the topic. If one is inclined, I could use help with logistics and public outreach. P. S. Ask me about the many positive benefits of this technology. Specifically, ask me about the work of David Eagleman (Baylor), Dr. Jack Gallant (UC Berkeley), Dr. Miguel Nicolelis (Duke University), and Dr. John Donoghue (Brown). The United States has a long history of non-consensual human experimentation. The Tuskegee experiments, the Willowbrook experiments on children with developmental disabilities, the atomic radiation experiments on people, and the testing of LSD on unsuspecting victims during the MKULTRA program all involved non-consensual illegal human experimentation. For a historical treatment and primer of non-consensual human experimentation, I recommend the book Against Their Will: The Secret History of Medical Experimentation on Children in Cold War America by Allen M. Hornblum, Judith L. Newman, and Gregory J. Dober. 4) The 1977 Joint Hearing is available in reprint through the University of Michigan on Amazon’s website. There are many more resources for this topic. I have posted them publicly on my Facebook page. Again, I want to reiterate just how grateful the Targeted Individuals would be for your support. We’re a marginalized and distressed sort of group. Our issue does come up in the news from time to time, but it is usually downplayed. We really appreciate your research and support. Thank you!